The overall race lead is hanging in the balance as Groupama sailing team battle longstanding Leg 7 leaders Abu Dhabi for a crucial victory with just over 100 miles remaining in what has been the closest leg of the 2011-12 edition yet. At 1300 UTC Abu Dhabi Ocean Racing were vehemently fighting to protect an 18 nautical mile lead, one that they have held since May 26 and which promises to deliver the Emirati team their first leg victory. But while Abu Dhabi were doing enough to stay clear, Groupama’s more southerly position had the potential to deliver better angles in conditions that are very much the French team’s strong suit — close reaching. Should the French team secure their second leg victory and finish two places clear of overall race leader Team Telefónica, who were struggling in sixth place at 1300 UTC, it would be enough to catapult them to the top spot, depriving the Spanish team of the lead they have held since the race started in October. The high-stakes finish in what Abu Dhabi skipper Ian Walker regards as one of the “blue ribbon” legs of the race is keeping the double Olympic silver medallist on high alert. “It’s quite a tricky finish all the way to Lisbon up the river against the current and the wind is forecast to go lighter, so I’m sure there’s going to be plenty of nervous moments,’’ Walker said. PUMA Ocean Racing powered by BERG, currently in third place, are not giving up hope of edging back into second, a position that they have been exchanging with Groupama for the past two days. Having survived the dreaded crossing of the 200 nm wide ridge overnight relatively unscathed PUMA skipper Ken Read said it was great to be back sailing in consistent wind, with the Portuguese trades propelling the fleet. Another challenge awaits, however, in the form of the two to four knot current that will work against the teams as they race the final miles to the Lisbon finish line. Read said he had scoped out the waters of the finish once before, while navigator Tom Addis had been doing his usual exhaustive homework with the help of watch captain Tony Mutter, who has special insight having lived nearby. “Let’s hope if we are behind it is as fluky as hell and if we are ahead let’s hope for a straight shot in,’’ Read said. In fourth place CAMPER with Emirates Team New Zealand are expecting to gain some miles on the top three, using their position in the south, near Groupama, to their advantage. “We should have a better angle set up down south. That is yet to play out but it seems a strong possibility,” skipper Chris Nicholson said. Team Sanya are in fifth place, holding a narrow lead of about seven nm over Team Telefónica in sixth. 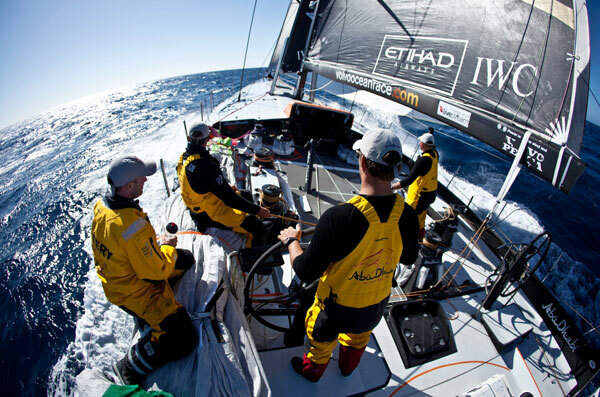 The first team is expected to cross the finish line at 2200 UTC. A maximum 30 points is up for grabs for the winner, which could prove vital with just 14points separating the top four teams. Currently, Team Telefónica are on top of the overall race leaderboard with 165 points, followed by Groupama, 158, CAMPER, 152, PUMA, 151, Abu Dhabi, 74, and Team Sanya, 27.